Benefit from international medical trainers with 15+ years experience as clinicians and trainers. Our student to expert ratio provides optimal learning and individualized attention to enhance your educational experience. Learn the best, most in-depth and current techniques in facial aesthetics. Individualized attention offers an exclusive experience in the privacy and convenience of your own practice or at one of our training practices. The International Academy of Facial Aesthetics brings together the most comprehensive industry expertise and resources to provide members with continuous support within the facial aesthetics industry. No need to bring your own materials or model patients. CosMedic includes $300-400 in BOTOX® units with each registration. We also provide supplies and model patients for your convenience. At CosMedic, you will receive an intensive 2-day training consisting of the most complete and current education on BOTOX®, Dermal Fillers and Platelet-Rich Plasma (PRP) Aesthetics. 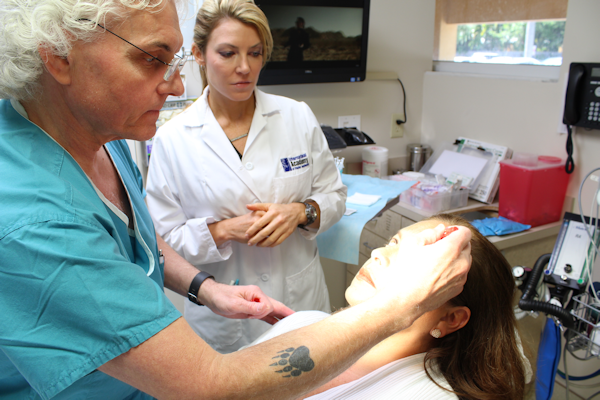 CosMedic is proud to be the top choice in facial aesthetic training for medical professionals. As a sister company of DentaSpa Seminars, the world's leader in BOTOX® and dermal fillers education designed exclusively for dental practitioners, CosMedic is focused on training Physicians, Surgeons, PA's, NP's, RN's and LVN's on the necessary skills to successfully implement aesthetic treatments into their practices. The importance of training is undeniable and facial aesthetics is as much of an art as it is science. The team at CosMedic firmly believes that receiving superficial training alongside numerous unrelated modalities is detrimental to not only the medical professional but also the patients you wish to help. Our 2-day intensive training includes a full day of hands-on consultations and treatments performed in clinical setting with experts that have more than 15 years of experience as clinicians and aesthetic trainers. At CosMedic, you can rest assured that you will receive the most complete, current and unencumbered education focused exclusively on facial aesthetics. Our training is focused exclusively on the art and science of facial aesthetics, unencumbered by unrelated modalities crammed into a hurried schedule. The drive for cosmetic treatments is ever increasing and driven by the baby-boomer generation. No longer an option reserved for the rich and famous, BOTOX®, Fillers and PRP treatments have become commonplace offerings and present a lucrative opportunity for your practice. Additionally, increasing rates for malpractice insurance and declining reimbursement rates have driven many medical professionals to seek alternative sources of revenue. According to the American Society of Plastic Surgeons, American Board of Medical Specialties-certified physicians more than doubled the number of minimally invasive cosmetic procedures they provided between 2000 and 2012. Adding a cash-based revenue generator such as facial aesthetics to a medical practice is a natural extension that can significantly boost the bottom line. Your patients are going to other businesses (potentially with much less training) for their aesthetic treatments. Wouldn't you rather offer them a safe, convenient option with someone they already trust that has received the most current and in-depth education possible? Your only investment is your training and CosMedic prepares all alumni with the tips, tools and skills necessary to become a successful facial aesthetics provider. Click here to begin your aesthetics training with the experts at CosMedic!